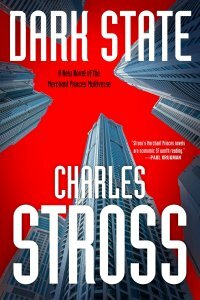 Dark State, by Charles Stross (Tor 978-0-7653-3757-3, $25.99, 352pp, hc) January 2018. Then, as so often lamentably happens in the life of a professional reviewer, I fell away from the franchise for the simple reason of having to cover a plethora of other good books whose demands left me no time for old favorites. So I noted with some interest at the start of 2017 that Stross was choosing to launch a “second season” of his franchise with the novel Empire Games. Was this possibly a good jumping-back-on point for me, without the necessity of reading the earlier stuff I’d missed? Before I could answer that question, the eighth book in the series, Dark State, landed on my doorstep in galley form! Curse that Strossian prolificacy! Something told me I’d better get on the bandwagon now, or risk never catching up! 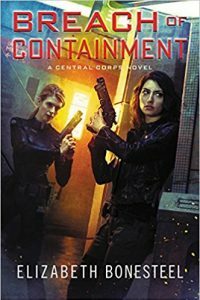 The first thing to establish for interested readers is the subgenre of SF occupied by Stross’s novels. They are part of the grand and noble lineage of multiversal exploration, or paratime/crosstime travel, or parallel world thought experiments. These stories about dimensions adjacent to ours, differing in their histories either slightly or greatly, can be traced from Leinster through Simak, Leiber, Laumer, Farmer, Piper, Heinlein, Moorcock, Norton and Zelazny, right down to the present-day series by Baxter & Pratchett subsumed under the rubric The Long Earth. 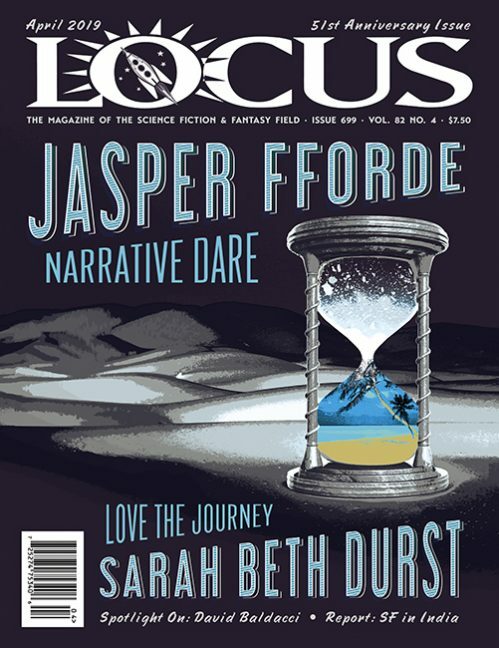 It’s a rich mode, offering literally infinite space for all kinds of speculative and adventure-centric tales, and Stross makes full use of these riches. Stross beckons us generously into his franchise with some upfront material in Empire Games. He explains that currently there are four known timelines. Time Line One is the original node of the world-walkers, those folks with an innate organic ability to cross between continua at will. Time Line Two is more or less our own continuity up till its disastrous intersection with Time Line One in 2003, resulting in an interdimensional war. Time Line Three is a self-standing realm with a vastly different history deviating from ours in the 1700s, resulting in a global French Imperium. And Time Line Four is in the midst of an uninhabited Ice Age and also boasts weird significant ruins of an enigmatic Forerunner civilization: a perpetually open Gate that leads to a black hole that was once another Earth. We soon encounter our previous heroine, Miriam Beckstein, in hiding on Time Line Three with the remnants of her world-walker Clan, fallen a long way from their prior perch of prestige and power. Licking their wounds, the Clan wants back in the multiversal power struggle, and will ally themselves with the native power structures of Time Line Three to achieve their goals. But our central focus will be Miriam’s young adult daughter, Rita Douglas. Raised by adoptive parents, Rita has no idea of her heritage. Not an active world-walker, she nonetheless carries the recessive genes for the ability. And now the security organizations of Earth have learned how to activate her latent traits. So they recruit her and begin the long process of turning her into a transdimensional spy. By the midpoint of the novel, she has made her first crosstime jump. Soon, Rita is being sent to spy on Time Line Three, where she is captured, meets her birth mother, and then is sent back to Time Line One as a diplomat for peace. Thus ends Empire Games. Stross has plenty of fun blending the kind of spycraft action he perfected in his Laundry Files series with zesty counterfactual speculations: life in a surveillance-crazy USA made paranoid by the world-walkers; the machinations of the French Imperium, etc. He builds up all the characters of his large cast with sharp, vivid strokes, assigning the wealth of individuating touches to Rita–we meet her uninhibited girlfriend Angie late in the novel and their relationship adds to Rita’s depths. And the novel ends on a suitable and satisfying plateau of action. Here the book gains a resemblance to the Baxter & Pratchett Long Earth scenario alluded to earlier. Our other new sphere of interest is the court-in-exile at St. Petersburg of John Frederick Hanover on Time Line Three. There, royal machinations involving the King’s plans to marry off his rebellious daughter Princess Elizabeth take center stage. She proves unwilling to comply and arranges for a covert abdication with the help of Huw’s brother Hulius. Meanwhile, Rita has become more closely enmeshed with her mother’s camp, making her question her loyalties to Time Line Two. Her adoptive grandfather, Karl Douglas, reemerges to ply his East German spy skills on behalf of the world-walkers. Finally, the open Gate on Time Line Four discloses something alien that could make all mortal plans moot. He couldn’t blame them, really. They’d all grown to at least early-adulthood before the revolution, in an age of rapid change—electrification, steam cars, motion pictures, aircraft. Even the superannuated dirigibles operating out of Fort Bastion had been shiny and new relatively recently. But the revolution had been followed by the establishment of MITI and its systematic program of education, industrial espionage, and planned technological disruption. We’re playing the ultimate game of Civ, Miriam had explained: attempting to duplicate the mystical, barely understood development surge that could take a country like Meiji-era Japan and bootstrap it from medievalism to the cutting edge of technology in a generation. In the United States, they’d gone from biplanes to ballistic missiles in fifty years. In New Britain, they’d gone from piston engines to space launchers in just fifteen—with a bit of help and, more importantly, the full fore-knowledge of why they might want to do that, and how to get there fastest. The genetic determinism imposed by the desperate need to conserve a valued recessive trait, combined with the frankly dismal status of women in a roughly medieval society, had turned the Clan’s politics into a double-layered game. Male aristocrats danced to the puppet strings of the grandmothers who arranged the braided marriages that kept the breeding program running. Angbard had provoked—or revived—a civil war within the clan by secretly approving a plan to use a fertility clinic in the United States to generate a host of carriers (and then, in the second generation, world-walkers) who would be loyal to the organization rather than the dowagers. His goal had been to put an end to the blood feuds that had almost destroyed the world-walkers during the twentieth century. But the backlash had been disastrous. All in all, the latest two extensions of this long-running series–it did begin fourteen years ago, after all–show no signs of diminished energies or inventions. My one quibble is that they follow the “decompressed” style of story-telling favored in modern comics. Although each scene is tight and well-constructed, it seems to take a greater number of them strung together to significantly advance the plot than what used to be the standard in the days of “compressed” storytelling–in SF and comics both. But this methodology seems to be what readers currently demand, and Stross has never been less than au courant. I find this “decompressed” style of story-telling not at all compelling, and will not be pursuing this next generation of entries. 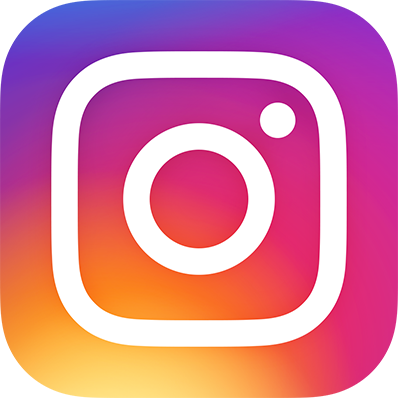 It seems to me that there is a certain purposeful lack of effort in this style — dare I say a lazy, lackadaisical approach. It just doesn’t work for me. Fortunately, I have a three-year backlog of books to read. I loved the series – until the U.S. bombed that world.